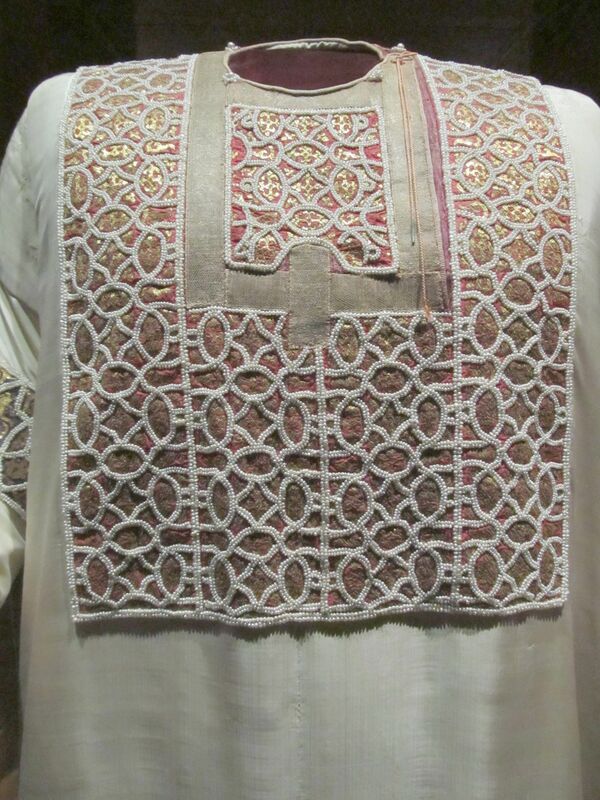 I barely sew men’s Byzantine clothing. I know where to look, where to point friends, but for the most part, I personally haven’t touched it. My husband is a Norman. He wears riding tunics, and basic linen gored tunics with keyhole necklines. He likes them, and looks good in them. His complexion and appearance echoes Anna Komnene’s description of Bohemond I of Antioch in the Alexiad almost verbatim. It’s disgusting how Norman he is. But we have a deal: I sew it, and he wears it. Up until this project, I’ve made him 1 “SCA Byzantine™” tunic, made from lovely wine colored thick linen with potamia and fancy cuffs, but it’s sewn to his usual Northern European tunic style, versus anything actually Byzantine. I’ve also made him exactly one Roman tunic, and one later Roman dalmatica with clavii stripes for when the weather is stupid hot. He mostly stays in his period, with long sleeves on in warm weather because he’s very fair. Lightweight linen is his friend. I’ve been meaning to try this pattern for a while, so, one day, I decided to sew things, and that he was going to deal with it. The mummies of the Manazan Cave City date from the 9th-13th Century, though I believe more recent studies are putting it at the end of this period. Manazan is located in the region of Cappadocia, in Anatolia, present day Turkey. This shirt is based on the mummy at the Karaman Museum. They haven’t updated their site since 2014, but if you’re reading this, thank you, Christobel and Peter, you helped me figure out pieces to my mental puzzle in constructing this based on Dawson’s descriptions. I haven’t really ever seen this done in the SCA. At least not in my parts, aside from a member of my household, who I think I may have given the link to. I knew that the standing collar was seen in some Byzantine art, but I always kind of avoided it, since I hate being choked and didn’t know what was going on. After finally making a series of these for my husband, I gained a better understanding of how the shirt works, and feel like a ditz for not trying it sooner. The Manazan tunic is, on the most basic level, a keyhole neckline with a placket over it. That’s it! Once you get that in your head, you look at the picture and go, “Oh.” Trust me, this is way easier than it looks at a first glance. An indigo linen version, without the standing collar, knee length. A white linen version as an esoforion/undershirt, with the collar, knee length. A swanky silk version as a court garment, ankle length. I had a surplus of weird, secondhand linens I wasn’t afraid to screw up something on, so I decided that the first version would be out of a mid-weight linen with a rich indigo color that straight up reminds me of blue jeans. (In retrospect, I’m pretty sure it’s real indigo dye, talk about a luck out.) I like the idea of wearable mockups. If it doesn’t work, then it doesn’t work, but if it does, then you have a finished garment. The way it works, is that the collar has to be completed before attaching the sleeves and side gores. The dark linen makes it hard to see details here, but here’s some photos of the construction. Kind of a weird closeup, but when I attach facings on the inside, I use a hand invisible hem stitch. This stops the bold lines of machine sewing being visible on the front, and tacks it down securely. The machine zigzag is lazy finishing on the edge of the facing. Finished and laid out on my table so you can see how high the gores go under the arm. On the Norman. Following the instructions of the pattern to determine measurements gave us a very wide tunic, but when you see period garments, they are rather baggy, if not “bulbous” on men’s figures. Onto the full construction with the band collar out of crisp, white linen that took me 6 washes to get it usable. The white allows a more visible depth to the layers on the collar, so I have more pictures. There really is no easy way to avoid handsewing on this pattern. You can if you want, but it won’t look right. After I attached the facing inside with the blind hem as seen above on the indigo tunic, I also attached the band collar to the inside by hand. You can do a machine running stitch when you initially attach it at the base, but when you flip it up and close it to the inside, hand is necessary, otherwise the outside will look ugly. I’m planning on handsewing a whole one for myself. View from the inside looking out, so you can see the keyhole neckline, the facing, the placket, and the collar. The same view from the outside. Let’s face it, this is basically Byzantine Han Solo. I actually screwed up. I made the band too short because I read the pattern wrong. I repaired this by adding another length of band, versus taking the whole thing off and starting again. My husband destroys collars because his sweat contains amine, a chemical used on submarines to purify the air that also dyes everything a gross shade of rust, so he kills tunics and bedsheets by the dozen. I’ll replace it once it gets gross. On the board, puffy before ironing, with the repaired collar. Actually on. I used a small white glass bead to make the toggle. Doesn’t it look so much more crisp than a normal keyhole? -Taking in the couple of inches doesn’t matter, this is a wide tunic. -Pay attention to the taper on the sleeves, men have forearms that women don’t typically have. I made them a little snug, but not uncomfortably so. For the grand finale, I wanted to see how I could really jazz it up. I had 3 yards of beautiful silk broadcloth in my stash reserved for when Gieffrei decided to dress like civilized folk, as well as my usual stack of dupioni remnants for trim, and a brocade I had stashed from when Sartor had a sale last year. The broadcloth was narrower than the panels I had used on the blue tunic, and just about where I cut them on the white one, so I lucked out. I was nervous that the longer length would screw with his stride, but it did not. Instead of putting the facing on the inside, I put it on the outside for some pizazz, and made the placket from the brocade. Added some cuffs with the dupioni, and bottom trim with the brocade, and voila. Kamision of the Holy Norman Jeff. Detail on the neckline before I finished it. I don’t have good pictures of him fully dressed head to toe, that’s next on the agenda. 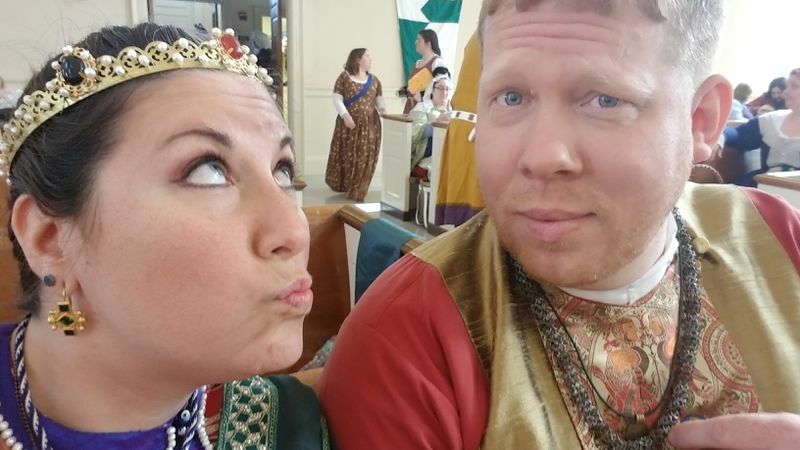 Here’s an extremely flattering shot of us both at East Kingdom Coronation, where you can see the band collar peeking out. The chain is tarnishing and already ruined it, so, I get to replace it sooner than him sweating amine, I guess. Boys are gross.